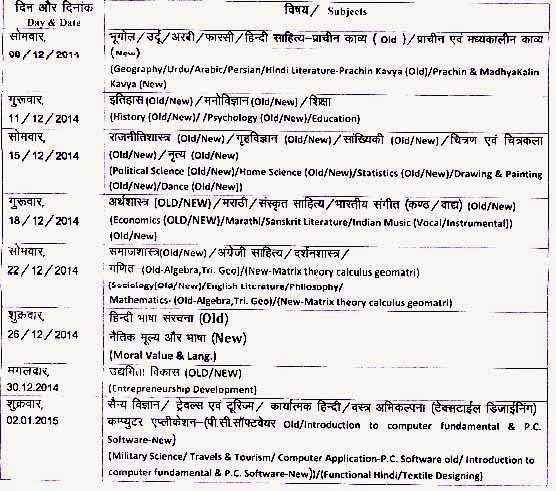 Devi Ahilya University DAU published the official notification regarding the availability of the admit card of Upcoming Semester / regular examination now DAU published the official notification for the Time table / Exam schedule of BA 1st semester regular / private / Ex student / ATKT ( old / new Syllabus ) examination session 2014 – 2015 . all candidates are informed that Time table of devi Ahilya university for examination program for BA 1st semester is available for download at the official website of DAU which is www.dauniv.ac.in Devi Ahilya University BA 1st semester, Examination will be start from 8 December 2014 . all examination will be completed on 2 January 2015. for those candidates who got ATKT in previous year they are required to appear in Old Question papers. candidates are also advised that admission card will be send to concerned college before the 3 day from the starting of the examination. So you can collect your admit card from you concerned colleges.